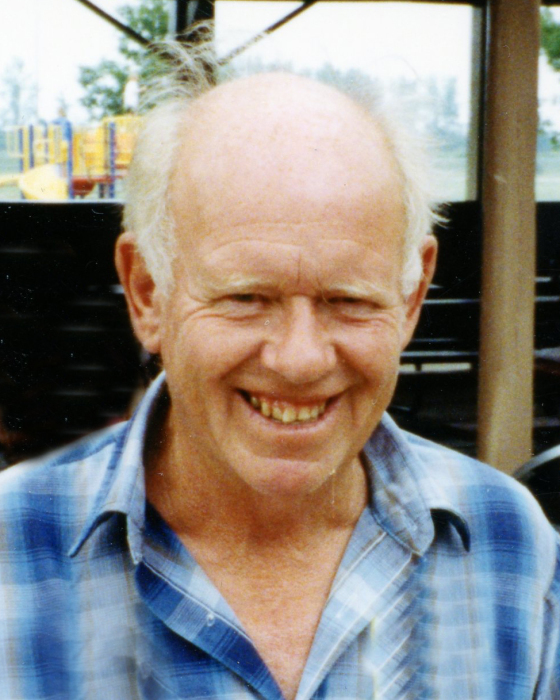 Edmund “Eddie” Pohlmann, age 95 of Melrose, passed away unexpectedly on Tuesday, April 2, 2019 at his home in Melrose, Minnesota. A Mass of Christian Burial will be held at 11:30 a.m. Monday, April 8 at Sacred Heart Catholic Church in Freeport with Rev. Vincent Lieser officiating and Rev. Marvin Enneking concelebrating. Interment will be in St. Mary’s Cemetery in Melrose. Visitation will be from 4 to 8 p.m. Sunday at the Patton-Schad Funeral Home and from 10:15 to 11:15 a.m. Monday at the church. Parish prayers with remembrances will be held at 6 p.m. Sunday evening at the funeral home. Edmund Pohlmann was born May 25, 1923 in Melrose Township, Stearns County, Minnesota to Joseph and Mary (Soenneker) Pohlmann. He married Bernadine Blommel on May 3, 1949 at Sacred Heart Catholic Church in Freeport. The couple dairy farmed north of Melrose until their barn burned in 1976. Eddie worked at Kraft Foods for 10 years until his retirement in 1987. He left the farm in 2011, moving to Rose View Manor where he enjoyed the company and activities of that community. He was a member of St. Mary’s Catholic Church in Melrose and Sts. Bernard and Elizabeth Council. He and Bernie enjoyed traveling together, taking many bus trips and a few airplane trips which Bernie wasn’t too thrilled about. Eddie was an incredible caregiver for Bernie when her health declined. He was a blessing to many; his faith in God and commitment to his family and friends will be remembered by all who knew him. In May of this year, Eddie would have celebrated 41 years of sobriety, something he and his family are very proud of. He helped many in the community. Survivors include his children, Elizabeth (Harald Moore) Pohlmann of Melrose, Lucy (John) Shonyo of Oronoco, Mary (Richard Loxtercamp) Pohlmann of Osakis, John (Sandy) Pohlmann of Harrisburg, South Dakota, and Jane (Sam) Salzl of Melrose; 13 grandchildren and 11 great-grandchildren; and sisters, Sister Paula Pohlmann, O.S.F. of Little Falls and Marie Dobmeier of Albany. Eddie was preceded in death by his wife, Bernadine Pohlmann; parents, Mary and Joseph Pohlmann; daughter, Ann Henderson; infant son; grandson, Adam Loxtercamp; brothers, Joseph Pohlmann and Lawrence Pohlmann; and sister, Valeria Boeckers. Mom and Dad have long supported the Melrose Area Food Shelf. In lieu of flowers, memorials are preferred to the Melrose Area Food Shelf.